Miis are digital avatars that appear in the Mii Channel, Mii Maker, StreetPass Mii Plaza, Miiverse, and various other Mii-centered games and applications. Miis get their name from the word "me," in the same way that the Wii gets its name from "we." Miis are based off of human beings, and players can design what their Miis look like and use them in compatible games. Shigeru Miyamoto had wanted to create digital avatars for Nintendo consoles since the Nintendo Entertainment System and kept trying to create them with every system released, such as the Nintendo 64DD add-on and Nintendo DS. Players can start from scratch or create a Mii from an existing template Mii. Only 100 Miis fit in one Wii console, while each individual Wii Remote can hold ten Miis. Miis can also be created on the Nintendo 3DS, Wii U, and the Nintendo Switch, as well as through the smartphone application Miitomo. They can be created either from scratch or from a photo, using Mii Maker, where they can be edited as well. 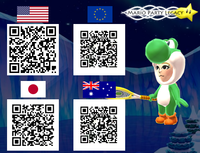 Also, Miis can be made into QR Codes, to be scanned from another Nintendo 3DS, or a Wii U. Each 3DS and Switch system can have up to 100 Miis, and each Wii U system can have up to 3,000 Miis. Hiroji Kiyotake's Mii appearing in WarioWare: Smooth Moves. Miis appeared with Wario in WarioWare: Smooth Moves. In this game, the Miis are used as personal files for the players, and are used in several microgames and in Multiplayer Mode to represent those playing. One of the multiplayer modes starring the Miis is very similar to the minigame Balloon Bang. The creators of the game also appeared in the credits as Miis, but were wearing costumes unable to be used by the player, such as Mario overalls. In the microgame Tightrope (one of 9-Volt's microgames) in WarioWare: D.I.Y., the purpose of the game is to prevent a male Mii from falling while holding a pole and crossing a tightrope. This microgame is based on the Tightrope Walk minigame in Wii Fit. The player's Mii appears in the "Tomodachi Life" microgame in 9-Volt's stage. A Mii playing the Chomping Frenzy mini-game in Mario Party 8. In Mario Party 8, Miis are playable characters and are sometimes seen in the background of mini-games, which are only playable in the "Extras" section. The Miis in this game wear overalls, gloves, and shoes like the Mario brothers. The shirt they wear depends on the player's color, not their favorite color. Miis are also available to personalize players' file. In Mario & Sonic at the Olympic Games, Miis are playable characters, just as capable of competing as the characters from the Mario and Sonic the Hedgehog series. Their stats are all five out of ten. In this game, the Miis have no voices and are simply called "Mii" during events. Miis return in Mario & Sonic at the Olympic Winter Games. This time, Miis can be customized to wear different clothes and accessories. Unlike the last game, the stats differ depending on the gear. They can even wear different costumes of the playable characters in the game. Some of the bosses from Festival Mode also give off their costumes for Miis to wear once defeated. In Mario & Sonic at the Sochi 2014 Olympic Winter Games, just like in the three previous installment on the Wii, the player can use their Miis as characters. As with the previous three installments Miis are customizable, however this time around Miis will actually show what type their clothing makes them. Miis appear in Mario & Sonic at the Rio 2016 Olympic Games once again as playable characters. Unlike previous installments, they are now playable in both the console and handheld version of the game. In the 3DS version, they are customizable as they were in past console games and are one of three characters who can be used in any event, the others being Mario and Sonic. They are the primary character in the Road to Rio mode of the game. Other Miis who act as townsfolk and opponents also appear in the story mode, and unlike the playable Miis, they have text dialogue. A Mii replacing Dr. Mario as the main character in Dr. Mario Online Rx. In Dr. Mario Online Rx, Miis are able to replace Dr. Mario as the playable character. Here, they must maneuver Megavitamins tossed into a glass jar in order to destroy the Viruses. In order for a virus to be destroyed, it must be connected to at least one Megavitamin of the same color. Unlike Doctor Mario, Miis speak. Miis can tell the player how many minutes have passed and how many capsules they've thrown. Mii (Outift A) driving in a kart in Mario Kart Wii. In Mario Kart Wii, Miis first appear as background characters, found in various race courses. They also appear in posters, and other signs, as seen in Coconut Mall. Later in the game, Miis can be unlocked as playable characters. There are two outfits available for Miis, and both outfits must be unlocked. 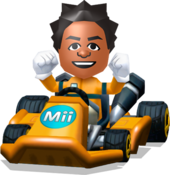 The first one (Outfit A), which is available when the Mii character option is unlocked, is a plain racing suit of the Mii's favorite color. The other (Outfit B), depends on the gender of the Mii. If the Mii is male, he receives a Mario outfit of his color (if the Mii's outfit is green, the outfit will look similar to that of Luigi), and if the Mii is female, she receives a Princess Peach outfit of her color (if the female Mii's outfit is yellow, the outfit will look similar to that of Princess Daisy). Additonally, all Miis have a +3 speed and Mini-Turbo bonus regardless of size. A kart's color scheme changes depending on the Mii's gender (primarily blue for males, primarily pink for females). Miis also receive generic voices for the first time, in Mario Kart Wii, which has a unique voice for each gender and favorite color combination, not counting small background noises that they first made in Wii Play's Shooting Range event. There are four different voice recordings for both male and female Miis, which changes pitch, depending on which size class the Mii is in (if the Mii is large-sized, the voice will be lower than normal, and if the Mii is small-sized, the voice will be higher than normal). The weight class for the Mii driver depends on the size in the Mii Channel. 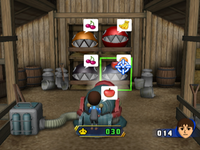 Notably, when the player plays as a Mii, statues and pictures in various courses, such as Moonview Highway, Luigi Circuit, Coconut Mall, Dry Dry Ruins, Toad's Factory, Koopa Cape, Wario's Gold Mine and Daisy Circuit, will replace the character heads with that of Mii heads, consisting of the Miis saved on a players Wii console. A Mii can be either a large, medium, or small character, depending on his or her height and weight. Originally, a Mii Outfit C was going to be added, but was cut from the final version of the game. A Mii, from Mario Kart 7. Miis later appear as racing participants in the Nintendo 3DS title, Mario Kart 7. They can be unlocked by completing all the Grand Prix cups on any engine class and are the only unlockable characters who do not have to be unlocked from a 150cc cup. Unlike in Mario Kart Wii, however, all the Miis get the same stat boosts and are the same weight (in this case, medium, as Mario and Luigi), which are at around average levels, and they have new voice clips. Miis also appear as spectators in several courses. Also, the Miis have two of their own courses, Wuhu Loop & Maka Wuhu, as well as their own battle course, Wuhu Town. All of these courses come from the game Wii Sports Resort. Their artwork is the only character artwork to show the character inside the vehicle. A Mii sprite from Mario Kart 8. All amiibo racing suits as of version 4.1 of the game. Miis appear as unlockable playable characters in Mario Kart 8. Here, they are the only unlockable characters who aren't unlocked at random, always being the eighth character to be unlocked. Their weight class is based on their size, just as in Mario Kart Wii, and their voices from that game return but in a higher pitch. The Miis also sport a new outfit unlike their appearances in Mario Kart Wii and Mario Kart 7 where they now wear a new racing suit (which is similar to the biker suits that Peach, Daisy, Rosalina, and Pink Gold Peach wear) with some white trimmings, a helmet with their color, and a light-colored scarf similar to the ones Peach, Daisy, and Rosalina wear along with black short boots. However, certain colored Miis have a unique coloring scheme. As of version 4.1, the player can also scan one of 19 amiibo into the game to obtain a racing suit and helmet for Miis based upon the scanned character. If the Miis have not been unlocked yet, they will be when any amiibo is scanned. Miis return in the Nintendo Switch port Mario Kart 8 Deluxe, this time available from the start, a first in the Mario Kart series. All of the amiibo Racing Suits return in this game along with an additional 20th costume based on the Splatoon series. They also appear as a spectator in Mario Kart TV. A Mii ready to bat in Mario Super Sluggers. Miis are playable characters in the game Mario Super Sluggers. Miis cannot be chosen as team captains, but up to 8 Miis can be used. Mii stats in this game are 6/10 and chemistry with other characters is based solely on favorite color (excluding Diddy Kong) e.g. red Miis have chemistry with Mario, green Miis have chemistry with Luigi, pink with Peach, etc. Miis of the same color but opposite genders also have chemistry with each other. Also, they possess the quick throw ability, which allows the players to make faster throws to teammates. Male and female Miis appearing during a commercial for Mario Sports Mix in North America. Miis are one of the nineteen playable participants in Mario Sports Mix. They're the all-rounder (All-Around) type, with Mario, Luigi, Yoshi and Ninja. Despite their height and width, they all receive the same stats: 3/5 in every stat. 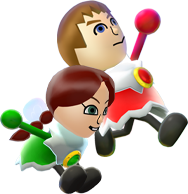 The color of their outfits depend on their favorite color and their clothing depends on their gender; male Miis receive a sporting outfit, while female Miis receive a skirt. Miis are also seen as spectators. Their special ability is very similar to Mario's special ability; they throw the object into a goal which can be blocked by a struggle of the opponent. In dodgeball, the shot causes a damage radius that hits anyone inside the radius. Miis receive voices in this game, a quality somewhat rare in games they appear playable in. On a side note, Miis will never appear as opponents in tournaments. Real life Miis made an appearance in various commercials to help promote the game in North America. They are sports anchors during these commercials under the names Mii-guel (later Michael) and Mii-chelle (later Lisa), showing gameplay footage to the players in various segments like the Super Top 3 Show, for example. Also, they announce a press conference on the day of the game's release, asking questions for Mario. Miis appear as playable characters from the beginning. If the player decides to start a solo profile, the he or she then has to choose a Mii for their profile. The only characters the player can use in solo mode is their Miis. The player can unlock clothes to dress up their Mii in the Dressing Room. Miis don't say anything to the other players; the time where they would talk is replaced by two of the Mii's opponents talking to each other. The color of the Mii's shop depends on the color of the Mii, but if one or more Miis have the same color, they will be changed depending upon order chosen. Miis also appear in the Nintendo 3DS title Mario Tennis Open as playable characters. Miis can be given different stats when they wear different clothes or costumes and have different rackets. When a Mii is equipped with a full gear set based on a character, enemy, or item, all stats will be boosted. Miis do not earn a star rank after winning all Mario Open cups. Only the player can control Miis; they cannot be selected as opponents or doubles partners. Four Miis on a grassy level with Giant Piranha Plants. Miis make their first appearance in New Super Mario Bros. U as playable characters only in the Boost Rush, Challenge, and Coin Battle Modes. The Miis can now use the same abilities as Mario, Luigi, Blue Toad, and Yellow Toad, as they can use power-ups like the Super Acorn and Fire Flower. If the Miis are selected as either P1, P2, P3, or P4, each will be colored with the overalls of Mario, Luigi, Wario, and a coloration similar to Luigi's blue alternate costume from the Super Smash Bros. series. Randomly generated Miis appear in various places of the background in Boost Rush Mode. Miis have the ability to play with or without a hat and female ones wear shorter overalls, revealing black socks underneath. In this game, the Miis reuse their voices from Mario Kart 7. In New Super Luigi U, the player's Mii can also be used if a trick is done on the Flying Squirrel Ovation level in Superstar Road which has the player holding down on the / or on the while selecting the level (if this trick is used on a different level in the game, the player plays as Nabbit instead). Miis are also able to post comments online about a level they have played through Miiverse. Official artwork of Miis in Super Mario 3D World. Miis return in Super Mario 3D World. Here, they serve as representatives of people who send messages and ghost data through Miiverse. The player can spot them standing around on the world map, where their messages pop up when Mario and co. get close. Players can also opt to send out ghost data on completed levels, and try to beat the time records on other people's ghost data as well. The player can race up to three Miis at once, in an attempt to beat their record. In the game, the Miis appear in Sprixie Princess costumes corresponding to their favorite color, and are shown to mimic the exact movement of the person using the Mii, (using Luigi's Scuttle, running on all fours like the Cat Suit, etc.) Miis also have voices in the game while doing a type of move. Occasionally a Mii will have a present behind them that when opened contains items or coins. In Mario Golf: World Tour, the Castle Club is a game mode where players play as their Mii and compete in tournaments and various other challenges. Like in Mario Tennis Open, player can customize their Miis with various clothing and clubs to alter their stats. The Miis in this game reuse the voices from Mario Kart Wii. In its post-hole animations, the player's Mii is joined by six others that wear the player's chosen color. Many more also appear in the tournament awarding ceremony wearing regular clothes, but the only Miis that wear costumes or clothing from the boutique are the player's, and the top three finishers. Miis (named Mii Fighters) were confirmed to be playable fighters in Super Smash Bros. for Nintendo 3DS and Super Smash Bros. for Wii U at Nintendo's E3 2014 event. When creating a Mii Fighter, the player can select it to have one of three different classes: Mii Brawlers, Mii Gunners, and Mii Swordfighters. Brawlers specialize in fighting melee style, while Swordfighters and Gunners utilize a sword and a gun in their movesets, respectively. Each class can select four out of twelve special moves, making up a total of thirty-six special moves. When playing online, Miis can only be used when playing in With Friends mode. When customizing a Mii, the player is able to equip it with custom outfits and headgear, with more available to be purchased as DLC. In terms of equipment, all Miis can use the Jacket and Boots equipment; Mii Brawler can use the Gloves; Mii Swordfighter can use the Sword; Mii Gunner can use the Arm Cannon. The Multi-Man team in this game is also composed of Miis, called the Fighting Mii Team, replacing the Fighting Alloy Team from Super Smash Bros. Brawl. Miis are loaded from those saved on the console and given a random class of Mii Fighter. These Miis are dressed full black, and cannot use shields, special moves, and items. They also cannot grab ledges, but will use a Footstool Jump on other Miis to recover. In Super Smash Bros. for Nintendo 3DS, regular Miis also appear in the Tomodachi Life stage, also randomly loaded from the system. Masahiro Sakurai has stated he considered including Miis as fighters in Super Smash Bros. Brawl before being ultimately decided against it. Wii U Super Smash Bros. for Wii U This fighter is based on a player's Mii and favors a sword in battle. Enjoy the extra reach the sword offers, but remember that it takes a bit longer for strikes to reach your opponent as a result. Customize your Mii with chargeable moves, counters, or projectile attacks. A fighter based on your Mii! The main draw of Sword Fighters is the extra reach that they get thanks to their swords. On top of that, they have a lot of varied moves to choose from. Unfortunately, a lot of sword attacks have a bit of delay between pressing the button and landing the attack, so you'll need to be very careful not to leave yourself open! Wii U Super Smash Bros. for Wii U One of the Mii Swordfighter side specials actually uses a throwing disc called a chakram! How quickly you press your desired direction controls how fast and far the chakram flies and how much damage it does. Several other moves, like Skyward Slash Dash, also work in this manner. One of the Mii Sword Fighter side specials actually uses a throwing disc called a chakram! How quickly you choose a direction controls how far and fast the chakram flies, as well as the kind of damage it does. This kind of quick-aiming action also applies to other special moves, like Super Slash Dash. N/A The Mii Swordfighter will rise its sword, firing multiple shock waves forward in its Final Smash. The waves will expand outward and push foes off the screen. Walls and the ground can't stop this display of power, so this Final Smash is exceptional at taking out several rivals at the same time. With sword held high, Mii Sword Fighter unleashes a barrage of shock waves. They spread out in a fan pattern, dealing multiple blows to foes they touch, while also pushing them towards the edge of the screen. This Final Smash can even hit through walls and floors, making it easy to attack lots of opponents at once! Wii U Super Smash Bros. for Wii U These weak fighters show up in droves in Multi-Man Smash. There are Brawler, Swordfigher, and Gunner types. Since they're based on the Mii characters saved on your Nintendo 3DS and Wii U console, you could end up battling friends and family! Don't get soft - just take them out! Almost any attack does the trick. These weak fighters show up in droves in Multi-Man Smash. There are Brawler, Sword Fighter and Gunner types. Since they're based on the Mii characters saved on your Nintendo 3DS system or Wii U console, you could end up battling friends and family! But forget that - just take them out! Any strong-ish attack does the trick. Artwork for the Mii Fighters from Super Smash Bros. Ultimate. Mii Fighters return in Super Smash Bros. Ultimate. Their proportions have been altered so that they have smaller heads, and their default clothing have been altered as well. Additionally, players can choose between 12 different voice options to set for their Mii Fighters, each of which can be played at three pitches: low, medium, and high. In total, Mii Fighters have 36 selectable voices; additionally, the Mii Fighters are unique, in the sense that, they are the only characters to retain custom specials. Though Mii Fighters still have customizable outfits, their body proportions cannot be adjusted in-game; Mii Brawlers have set weights of 94 units, Mii Swordfighters have set weights of 102 units, and Mii Gunners have set weights of 104 units. Miis in Mario Strikers Charged used to represent the player. Miis also appear in games such as Donkey Kong Barrel Blast, New Play Control! Donkey Kong Jungle Beat, and Mario Strikers Charged to represent the player, similar to an avatar. In Super Mario Galaxy and its sequel, players can personalize their files with Miis. This has also been done with other non-Mario related games. In Super Smash Bros. Brawl, players can use their Mii on Wi-Fi to represent themselves. In Mario vs. Donkey Kong: Tipping Stars, Miis were likewise used to represent users with a profile, which allowed them to post levels in the Community mode, although this is no longer possible due to the discontinuation of Miiverse. Miis appear along with Mario, Luigi, Blue Toad, and Yellow Toad in the Wii U experience game New Super Mario Bros. Mii. If the Miis are selected as either P1, P2, P3, or P4, each will be colored with the overalls of Mario, Luigi, Wario, and Mario's colors from Mario Bros., respectively, just like New Super Mario Bros. U.
Mario, without his hat, was the first contest in the Check Mii Out Channel. Luigi, without his hat, was a later contest. Another contest had players create Princess Peach. Another contest was "Someone like Mario, but a little different". One contest focused on Bee Mario. A contest focused on "someone that helps a princess", which makes a reference to Mario and Link. One contest was "Wario without his hat". For this subject's image gallery, see Gallery:Mii. If the player goes on the Internet Browser on the Wii U from the home menu and the curtains are closed, the spotlights shine on the curtains for about 15 seconds, then the current user's Mii comes up and starts doing different activities. They include singing, juggling, dancing with a baton, dancing with a striped cane as if it is a baton, doing a magic trick, playing rock, paper, scissors with the user, and sleeping. Miis are the only playable characters in the Super Smash Bros. series represented with the Super Smash Bros. emblem and the only fighters in the series not to be fought in All-Star Mode. This page was last edited on April 8, 2019, at 00:12.